New book tells the story of the Stavros Niarchos Cultural Center, but can a building this wasteful really be called “green”? The idea that work by Renzo Piano—winner of a Pritzker Prize, among numerous other awards—could be corrected by anyone, let alone a far less known firm, would be surprising under any circumstances. What made it especially so is the stark disparity of styles between the two offices. But Piano prevailed: “Having initially greeted [Mecanoo founder Francine] Houben with his usual charm, the Italian architect barely glanced at the Mecanoo proposal in late 2013 before rejecting it out of hand.” In the course of writing the book, Newhouse developed expertise on subjects as diverse as the history of philanthropy in the Ottoman world and the acoustical preferences of Southern Europeans. The book is a kind of encyclopedia. But there is one significant lacuna: Newhouse calls the building “a triumph of environmental sensitivity.” In fact, the building, despite incorporating enough “green” features to achieve LEED platinum status, is inherently wasteful. First, it’s not clear it was needed in the first place. 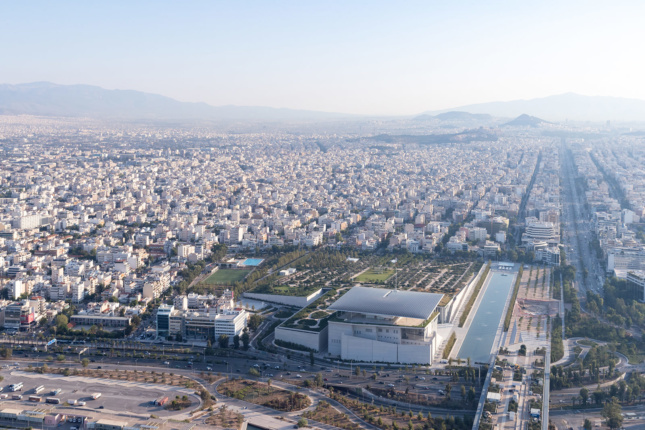 The Greek National Opera, though lacking a purpose-built home, has performed “with great success” at the Megaron Concert Hall in the center of Athens, Newhouse reports. As for the library, its existing building, also in the center of the city, could handle far more visitors than it received. Consequently, Newhouse writes, “no one was able to realistically define the new library’s purpose.” Neither organization had a director at the time the planning for the cultural center began. And with the country in economic crisis, the entire enterprise, Newhouse observes, “defied logic.” But the Niarchos Foundation was determined to build something important, and its resolve only strengthened when the Greek economy collapsed. True, Piano’s best buildings, including New York’s Whitney Museum of American Art, exhibit an inherent modesty (as does Piano himself). But the Niarchos Foundation encouraged Piano to think big. 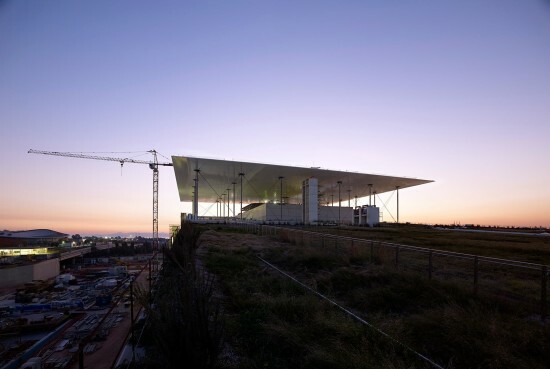 After visiting the Athens site, he decided to give the library and opera separate buildings, facing a modern agora (through a pair of enormous glass facades) and set them into a manmade hill, more than 100 feet high at its peak. “It was an almost childish idea: I simply lifted the ground’s surface to make way for the architecture,” Piano told the author. Creating the hill would involve building vast retaining walls, moving some 654,000 cubic feet of earth, and protecting all of it against seismic activity. That was accomplished by filling steel tubes with rocks, then hammering the tubes into the earth at 10-foot intervals, creating some 3,500 “gravel piles” in the process. Those processes required vast amounts of energy. Then came the planting of the center’s 40-acre garden, much of it on raised ground, and the extensive irrigation required to keep it alive in arid Athens—a process that involves both pumping water uphill and passing it through a reverse osmosis desalinization plant. The hill, that “childish idea,” is a grown-up energy consumer. Overall, operating the cultural center will require 14 gigawatt-hours of electricity each year, Newhouse reports. Producing that much power through the burning of coal—the predominant source of electricity in Greece—will create some 30 million pounds of CO2 or its equivalents, according to the best available figures. 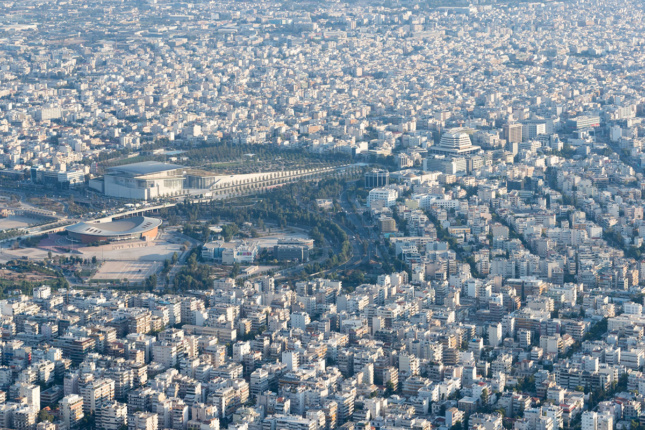 That’s about as much 1,500 average Greeks produce each year. True, setting the building in a hill could reduce the cooling load by as much as 7%, Newhouse reports. But counting that as an environmental victory is like counting gambling winnings while ignoring losses. And, true, the vast building has a substantial photovoltaic system. In fact, after the artificial hill, its most prominent feature is the canopy atop the opera house, a kind of flying carpet supporting 87,000 square feet (about two acres) of photovoltaic panels. That certainly sounds green. But the panels, even with the latest technology, will produce just 2 gigawatt-hours of electricity each year, or about 15% of the building’s needs. (And that’s if all goes well.) And even that power isn’t “free,” environmentally speaking. Thirty steel columns, braced by diagonal cable ties, support the p.v. panel-covered canopy, which is estimated to weigh 4,700 tons. The carbon footprint of structural steel is enormous. And solar panels themselves require energy to fabricate, transport, and install. There is no free lunch, energy-wise. Making matters worse, the Center is two miles from the nearest subway stop. Hard to reach by public transit, it contains 1,000 parking spaces, evidence of its reliance on private cars. LEED doesn't take any of that into account. It is essentially a checklist system, conferring points for “moves” like providing bicycle racks and using recycled building materials. Whether the building should have been built in the first place; whether it could have been built closer to public transportation; or could have been significantly smaller than it is—the big-ticket items, environmentally—are the very issues LEED ignores. Of course, I understand the need for symbols, which can help uplift societies (especially societies as troubled as 21st-century Greece). And I believe that the Niarchos Foundation had the best intentions when it vowed to make the building green. But the building it built is anything but green, and LEED is its enabler. With its “platinum” imprimatur, LEED sends a message that even unnecessary buildings, on sites ill-served by public transportation, and requiring vast amounts of energy to build and maintain, are good for the environment. Which, at this time of climate crisis, triggered by energy consumption, is a dangerous message to send. Chaos and Culture: Renzo Piano Building Workshop and the Stavros Niarchos Foundation Cultural Center in Athens is available from Monacelli Press. 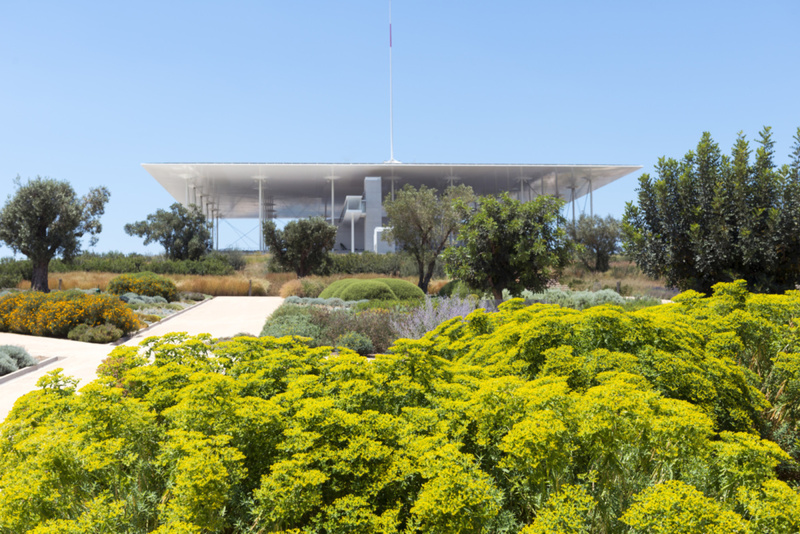 For years, Renzo Piano has been working to complete his design for the Stavros Niarchos Foundation Cultural Center in Greece. Not, the cultural group behind the project has announced that a key component of the Visitor’s Center, the energy canopy, is now complete. https://youtu.be/_LoJfZwZvb8 Suspended over the Greek National Opera, the canopy is composed of 30 columns and 717 individual precast pieces—weighing in at 4,700 tons overall. Although designed to appear light and airy, the canopy is 328-feet-square and 150-feet tall. Topped with photovoltaic cells, it will produce 2GWh of energy per year, fueling the opera house and the National Library of Greece. The Cultural Center includes the national library, opera house, canal, and 42-acre park south of Athens. The site was originally used for parking during the 2004 Olympics and once the project is completed, it will be turned over to the public. Total cost for the project is an estimated $831 million. Next steps include finishing the Lighthouse, the 9,700-square-foot glass room, and finalizing the flooring, facades, and ceilings. The rest of the SNFCC is expected to be complete in the first half of next year. 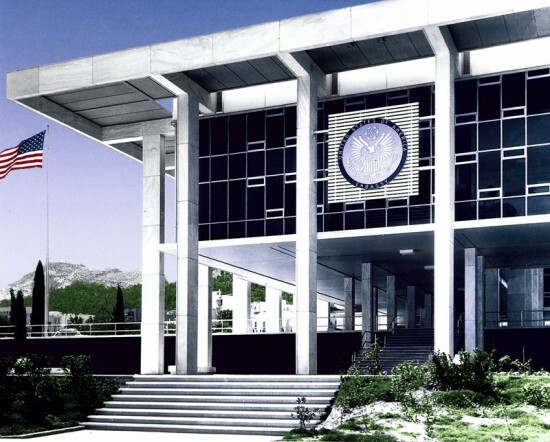 SNFCC hopes that programming in the Visitor’s Center will engage the community and connect the public to artists in Greece and around the world. Already, it has hosted over 300 events and welcomed over 55,000 visitors. From now until Christmas, the center will be a Santa Workshop, and in February 2016 the center will relocate to a temporary building until construction is complete. To learn more about the cultural center, read our initial article on the project here. Infrared is a group of architectural researchers and fabricators based in Thessaloniki, Greece. Initiated in 2010, the group’s work has included public installations like the Thess Bic Seat, an amorphously shaped bicycle rack and bench. Another piece called 313 / 315 is a 25-foot-long seesaw installed between two rooms of a derelict hotel created for last year’s XV Biennale De La Mediterranee. For its most recent installation, titled Madren 5340, the team investigated the theme of private space with a digitally modeled screen made with a series of paper tubes. In effect, each paper-tube is becoming something between a voxel and a pixel: it is positioned in space trying to represent a thin volume that reads as a surface—the properties of the volex—while at the same time displays a certain intensity of light—the properties of the pixel. The aggregation of the tubes is approximating the curvature of the initial surface. The digitally generated information was exported into assembly sheets—essentially a map of where and how to place each tube. The piece was installed in January as part of Thessaloniki’s Platforma 1 temporary exhibition, organized by ArqLab and Art|House gallery.